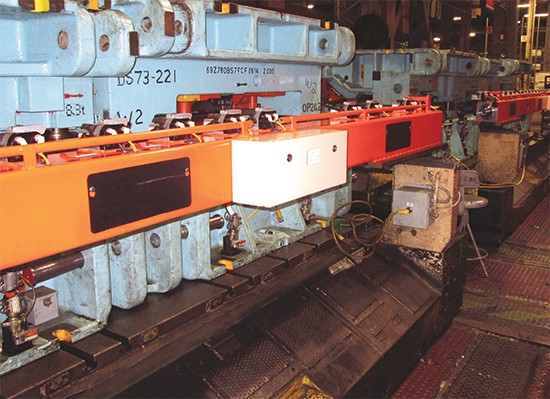 A transfer-retrofit project at Ford’s Flat Rock (MI) assembly plant has replaced aging mechanical systems with new electronic floor-mounted servos on existing presses. Besides cutting maintenance, the new transfers have significantly boosted speed. With the gettin’ good, the automotive industry has no time for downtime. Even running at full tilt, automotive OEMs have to maximize press performance. That’s Ford’s thinking, and with worn press-line components slowing production and requiring more and more maintenance, a change was in order. That’s why the Dearborn, MI-based automaker decided to embark on a program to switch out its aging mechanical transfer systems with state-of-the art servo-driven systems on its 2000-ton Komatsu presses at Flat Rock (MI) Assembly. Half a decade in, five lines have undergone retrofits, leading to a big boost in big-part production. Churning out Ford Fusions and Mustangs, the 3,000-plus employees at Flat Rock hustle and bustle throughout the nearly 3-million-sq.-ft. plant. The problem: original transfer systems on the quarter-century-old presses, the mainstays in producing body panels, had seen better days. The old transfers at Ford Flat Rock, dating from the late-1980s, utilized large shafts driving down from top portions of single- and dual-ram presses to mechanical cam boxes. Over time, Ford would rebuild the cams and other mechanical components, but downtime became more and more of an issue. And even with the rebuilds, speed eventually suffered. The transfer challenges were such that in 2009, Ford embarked on a replacement program, swapping out the old with new floor-mounted electronic transfer feeds (ETFs). 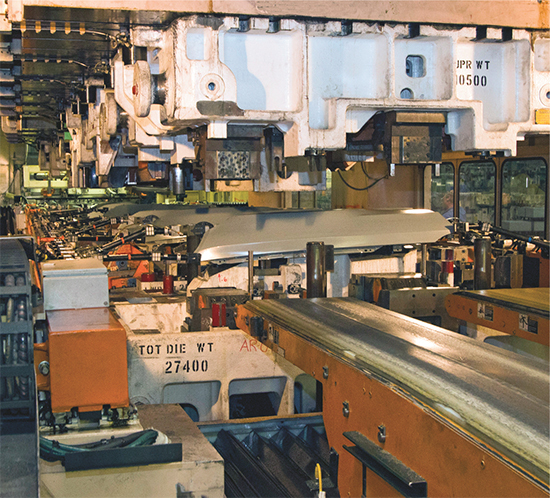 Linear Transfer Automation, Barrie, Ontario, Canada, replaced all five, beginning in 2010, with the latest ETF entering production this past July. As was the plan, the new transfers have brought greater speed and increased flexibility to the press lines at Ford Flat Rock. “The new ETFs are offering 35-percent improvement over the mechanical transfer systems,” says Sparkes. A Mustang fender exits a 2000-ton press at Ford-Flat Rock. The ability to smooth the transfer curve via simultaneous x-, y- and z-motion has upped strokes/min. during Class-A part production. Critical to upping transfer speed with the ETFs is the ability to add motion range profiles. Such an increase in range assists as Ford adjusts motion profiles. “With electronic transfer, we can start to change profiles to increase jobs per minute,” he says. “The mechanical transfers limited us to in-out and up-down motions. With electronics, we can look for transfer shortcuts. For example, as the transfer rises, instead of performing a complete rise before any other movement, it can begin to advance at the same time. We are looking for ways on each job to make the transfer stroke more efficient. The ETFs also enable Ford, if it chooses, to add efficient pick-and-place motion to presses that never used such movement. Unlike standard transfer motion where a transfer just enters to grab and move parts, pick-and-place transfer provides entry from the top, with suction cups grabbing and moving a part to the next station and the transfer lifting between the dies during the hit. Pick-and-place, according to Stirrett, typically occurs at Tier One operations, which employ both standard and pick-and-place transfer modes, a regimen also known as crossbar functionality. Ford’s transfer upgrades are not limited to Flat Rock. The company’s Buffalo stamping plant recently has gone through a press-controls upgrade—replacing 20 to 25-year-old control technology—across eight presses, with one also receiving a Linear ETF. Ford opted to maintain its current press-control setup at Flat Rock, as those systems are much newer, according to Sparkes. The press line at Buffalo boasting the new ETF runs new aluminum-part dies for the F-150. See also: Komatsu America Industries, LLC Press Technology Division, Linear Transfer Automation Inc.